This week’s Knot of the Week features two different ways to tie a hasty webbing harness that can be used as a backup rappelling harness in case of an emergency. Tied with 1″ Mil-Spec Tubular Webbing, these featured harnesses have a rating of 19 kN or 4,200 lbs. Tubular Webbing is commonly used in climbing and readily available in either Mil-Spec or Climb-Spec. You’ll find that these are very similar and maintain roughly the same 19 kN rating. 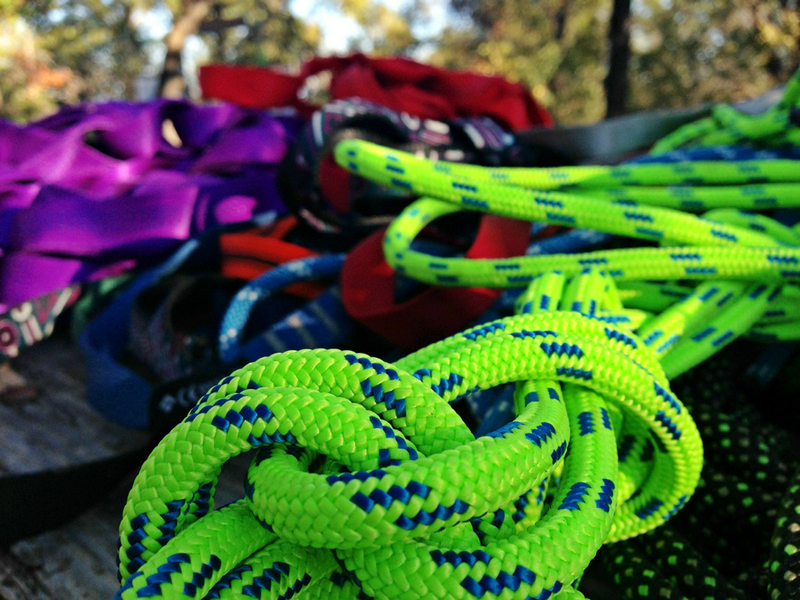 If you’re looking to source 1″ Tubular Webbing, here’s a great resource that aggregates pricing and availability from popular online retailers like REI, Amazon, Summit Hut and many more. The first way that we’ll show to tie a Hasty Rappelling Harness is very similar to the Swiss Seat, but as the name implies, hasty. There are ways of reinforcing this harness with tape knots, which we point out in the video below. 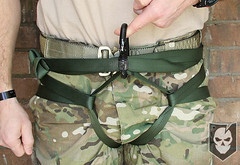 This first harness example is tied with 18 ft. of Tubular Webbing and is easily stored in a cargo pocket. One of the main benefits of this harness is that storing the webbing coiled and flat minimizes space and takes up much less room than 18 ft. of rope. 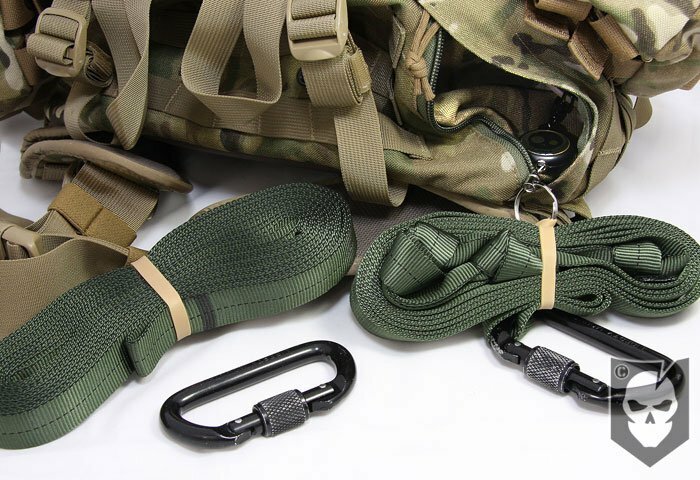 Tubular Webbing is also more comfortable to use as a harness, but the purpose of backup harnesses like these is for emergencies, and comfort really shouldn’t be a concern in those situations. 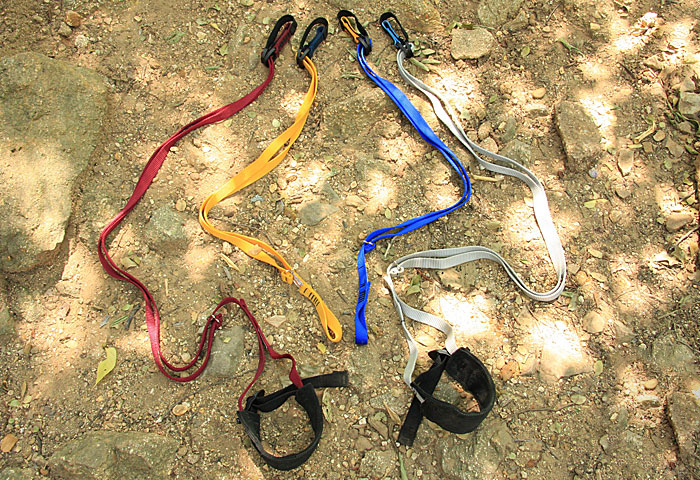 The second method we’ll show to tie a Hasty Rappelling Harness is something we’ve come up with recently. It utilizes 12 ft. of pre-knotted Tubular Webbing (a Tape Knot that’s been backed up) to make a runner of sorts that can be easily donned in a hurry. This method is much faster than the first example and uses less webbing. It’s not as secure as the first harness, but if seconds count, it will get you down. 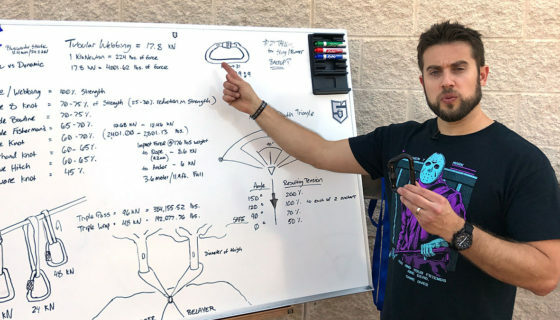 It’s also more compact and easier to store than the first, and as you’ll see in the video, it fits very nicely into the flashlight cave of a TAD Gear Fast Pack in conjunction with their Cable Retractor. What really makes this method shine is its ability to augment a Rigger’s Belt. As you can see from the picture to the right it would be very easy to clip this into the loop. 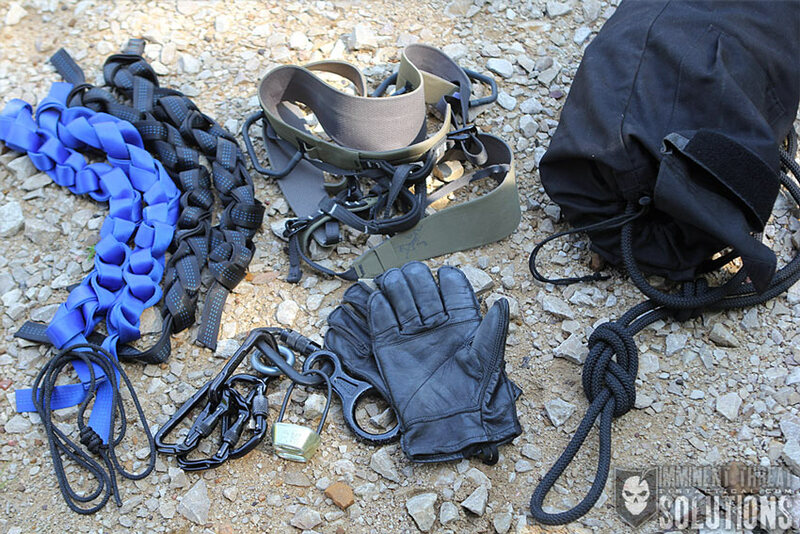 When used in combination with the Rigger’s belt you’ve truly got a bombproof backup system. No leg support has been a common complaint with a Rigger’s Belt, but when used in combination with this method, it will be sure to satisfy. Both of these harnesses utilize Rigger’s Rubber Bands to hold them together for quick deployment when needed. Here’s a link to an article we wrote on Rigger’s Rubber Bands, they’re definitely the right choice for this application. Always use a locking carabiner when tying these harnesses and remember to “Screw Down, so you don’t Screw Up.” That’s something helpful to memorize so that you’re always screwing the locking gate on a carabiner “down.” If gravity comes into play it will rotate the carabiner closed, not open. 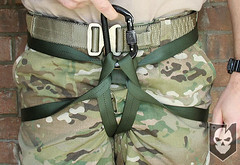 Hasty Webbing Harness #1 » Misc. Hasty Webbing Harness #2 » Misc. Rappelling is inherently dangerous. This information is provided for educational purposes only, and should not replace training from an experienced guide.